Kid friendly finish - natural or plastic? 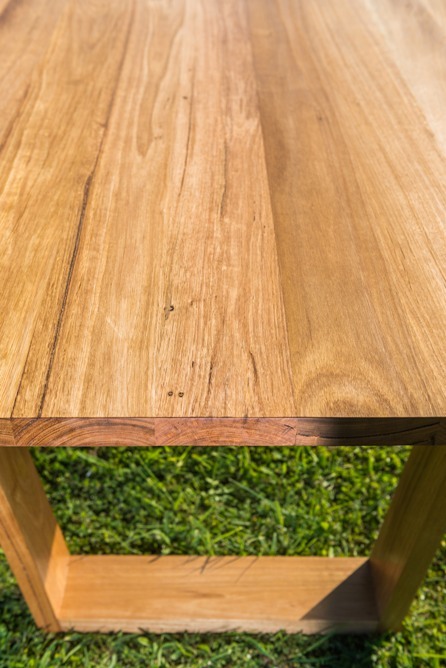 I have been wanting to find out how durable our oil and wax natural finish really is. With a 2.5 year old and a 11 month old, our Bombora table gets a work out! Whether it is sticky honey toast fingers, spilled milk or over enthusiastic crayon usage, the surface sure cops a beating. Being a scientist at heart, I have been holding a little experiment by ignoring all of our own advice and not reapplying the wax.... ever. 2 years later and the surface is still water proof with no stains or marks. 1- As proven by my experiment, the natural wax finish provides an excellent protective layer on the timber from liquid spills or mug rings. 2- We prefer the feel of the natural wax finish. It is more soft and less shiny. It makes the timber feel like timber rather than like plastic. 3- We prefer the look of the natural wax finish as it gives the piece a matte look with a slight sheen rather than being reflective and shiny. It looks like well aged timber smoothed from years of being touched rather than lovely wood covered with a layer of plastic. 4- The natural wax and oil finish is easy to repair if there are little scratches from everyday use. All that is needed is to reapply the wax and and mark will disappear like magic! With a two pack or plastic finish, to repair the scratches requires a full sand back and reapplication of the product. Click here to find out more information about the finishes and the timber we use. Please note: Don't try this experiment at home!